Growing up, Dr. Tara Mohl was very involved with sports. As she got older, her love of fitness developed into a keen interest in how the body functions. Although she wasn’t sure exactly what career she’d pursue, she knew she had a definite interest in working in a health care field. During her undergraduate schooling at Nebraska Wesleyan University, Dr. Mohl received a Bachelor’s degree in Exercise Science. During this time, she began working with a local chiropractor, and everything changed. She couldn’t believe how excited the patients were to be there and felt so much better after their adjustments. That’s where Dr. Mohl’s passion for chiropractic was born. She then completed her chiropractic training at Cleveland College of Chiropractic in Overland Park, Kansas, graduating with honors. 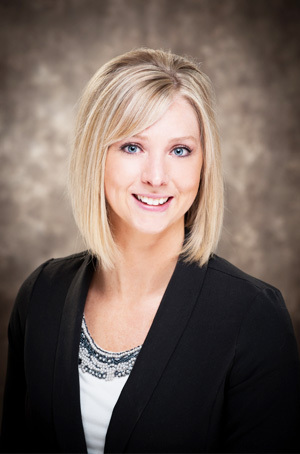 While in chiropractic school, Dr. Mohl interned in a local clinic. The clinic specialized in a technique called Clinical Biomechanics of Posture® (CBP®), which sparked her interest. She pursued a certification in CBP® and regards this as one of her greatest accomplishments. CBP® presents a different way to help chiropractic patients, and Dr. Mohl will tell you she could never go back to adjusting without it. Dr. Mohl also earned a certification in the Webster Technique from the International Chiropractic Pediatric Association (ICPA). The Webster Technique allows her to assist expectant mothers with their unique needs. Whether she’s caring for infants, pregnant women, athletes or the elderly, Dr. Mohl enjoys helping her patients move better, feel better and improve their overall well-being. When she’s not in the office, Dr. Mohl enjoys spending time with her husband Brian and their young son. As a young mother, she relates well to her pregnancy and pediatric patients and enjoys sharing in their experiences. Dr. Mohl is still an avid sports fan, cheering on the both the Royals and the Huskers. She also enjoys playing sand volleyball and slow-pitch softball, when time allows. Call our office today to schedule a consultation with Dr. Mohl and find out more about how she can help you find better health through chiropractic!